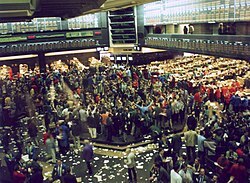 The floor of the Chicago Board of Trade, a major commodities exchange in the United States. A commodities exchange is an exchange, or market, where various commodities are traded. Most commodity markets around the world trade in agricultural products and other raw materials (like wheat, barley, sugar, maize, cotton, cocoa, coffee, milk products, pork bellies, oil, and metals). Trading includes and various types of derivatives contracts based on these commodities, such as forwards, futures and options, as well as spot trades (for immediate delivery). A futures contract provides that an agreed quantity and quality of the commodity will be delivered at some agreed future date. A farmer raising corn can sell a futures contract on his corn, which will not be harvested for several months, and gets a guarantee of the price he will be paid when he delivers; a breakfast cereal producer buys the contract and gets a guarantee that the price will not go up when it is delivered. This protects the farmer from price drops and the buyer from price rises. Speculators and investors also buy and sell these contracts to try to make a profit; they provide liquidity to the system. Some of these exchanges also trade financial derivatives, such as interest rate and foreign exchange futures, as well as other instruments such as ocean freight contracts and environmental instruments. In some cases these are mentioned in the lists below. Uzbek Commodity Exchange UZEX Tashkent, Uzbekistan Metals, crude oil products, chemicals, base oils, LPG and polyethylene, sugar, agricultural, etc. ^ "Madagascar Exchange – Commodity, Futures & Derivatives – Mex Madagascar". www.mexmadagascar.com. ^ "AHCX Malawi - AHL Commodity Exchange". ^ "Mauritian Exchange GBOT to Target Africa – Rebrands to BOURSE AFRICA". Finance Magnates. October 30, 2013. ^ Jakarta Futures Exchange (2018-06-15). "Market grows on where prices discovered". JFX. Retrieved 2018-07-23. ^ "Nord Pool Spot". nordpoolspot.com. ^ "POWER EXCHANGE CENTRAL EUROPE (PXE): About PXE". ^ "Saint-Petersburg International Mercantile Exchange: About". ^ "Moscow Energy Exchange: About".